A Christmas song about some of the “lesser known” reindeer. WHO DO YOU THINK PAYS THE BILLS? WE DO! WHO MISSES OUT ON THE THRILLS? WE DO! WHO DO YOU THINK CLEANS THE SPILLS? WE DO! WHO DO YOU THINK PACKS THE SLEIGH? It ain’t easy! WHO DO YOU THINK shoves the hay? It gets everywhere! WHO GETS LEFT OUT CHRISTMAS DAY? You guessed it! TO GIVE US NAMES THAT ARE LONG? AND HAD A CHANCE OF MAKING THE SONG! It’s no use, no one will ever happily sing our names in a song. Do you think they would? 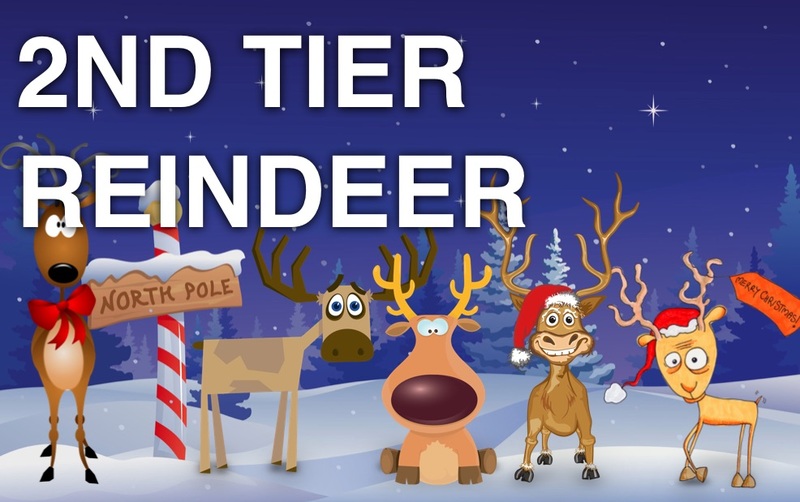 INSTEAD WE’RE SECOND TIER REINDEER – WHAT’S NEW?